We're after your help to build on the success of Santa's Charity Fun Run over the past nine years. 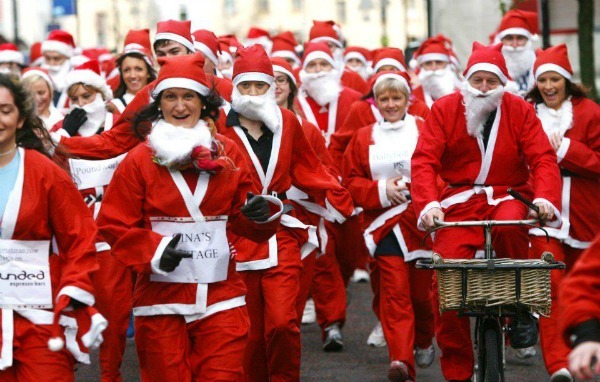 We are now putting together SANTA'S CHARITY FUN RUN 2013. Don't worry it will be a very short course and the emphasis is on participation and fun - IT ISN'T A RACE! This year the event is being organised in conjunction with turning on of the Christmas Lights in Newry, on Friday 22 November 2013, which is being hosted by Newry & Mourne District Council. The idea is that on November 22nd at 6.30pm we hope to have one hundred plus Santa's running down Hill Street. Each Santa would be a representative from a local business, club or school and each would wear their organisation's logo or message. It will cost you £100 per Santa. Santa's can, if they so wish, collect contributions. This money can be used to pay the £100 for the Santa Run. Proceeds raised will go towards the Newry Gateway Club, PIPS Newry & Mourne, Headway and Southern Area Hospice. The Santa suits are being kindly and generously donated but feel free to ACCESSORISE the outfit as you think fit and don't forget the beard! To be part of the MADNESS and enjoy the craic, complete the booking slip below and return a cheque / cash of £100, and we will supply you with your Santa outfit, logo sash and full instructions for the day. Green International, Dromalane Mill, The Quays, Newry, Co Down, BT35 8QS, Tel: 0283 025 4560.